FloBin Rentals | Bins for powders, liquids and viscous materials. Meeting & Exceeding Industry Standards, Everyday! To serve the chemical and petrochemical industry with their specific hydro-processing catalyst packaging needs FLO-BIN® rentals established their Intermediate Bulk Container (IBC) rental services in 1994. 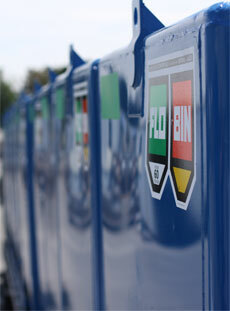 The design of our FLO-BIN® was done with optimization in mind. Whether typical reactor dump nozzle heights, logistics, handling or safety comes to mind, FLO-BINS incorporate the highest possible standards and efficiencies. With a vast inventory of ready to use FLO-BINS (IBC’s) and supporting infrastructure available to the chemical and petrochemical industry today, FLO-BIN® rentals serves both National and International customers with their catalyst change out packaging requirements on a daily basis. Our teams are ready 24/7 to assist you with any FLO-BIN or IBC request you may have and we invite you to contact one of our offices for further information and/or fill out the get more information form online.